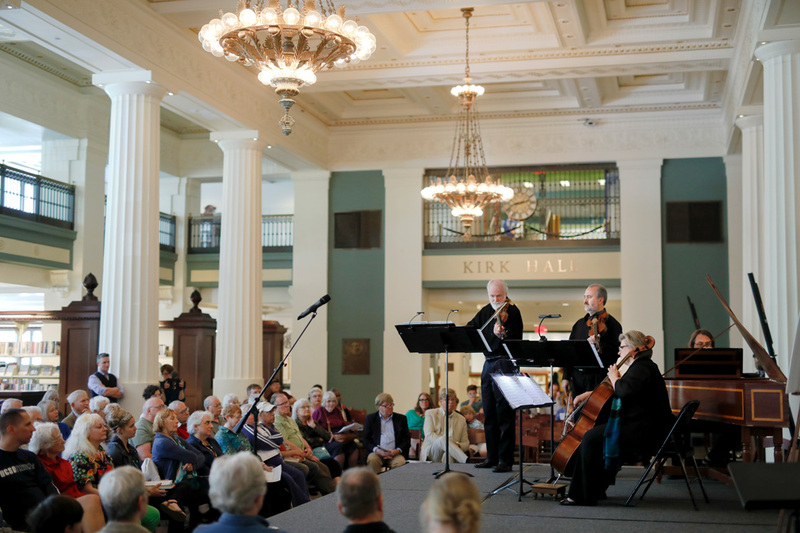 This June, Kansas City Baroque Consortium began its first summer series, “Between Silence and Light.” The series explores the journey artists make from inspiration to realization and the connections between, linking music with architecture, dance, writing and painting. The series got its name from John Lobell’s book, “Between Silence and Light,” a collection of words and images from architect Louis Kahn. “The goal is to explore how Baroque-era music reflects and can inform our experience of art work even across different genres and different art forms,” said Trilla Ray-Carter, founder and artistic/executive director of the Kansas City Baroque Consortium (KCBC). Kahn’s philosophy described Silence as “the unmeasurable,” that which is not, and Light as “the measurable,” or that which is. “Part of this grew out of my recognition that the arts don’t exist in isolation from one another. Not only do the arts reflect the philosophy and social climate of the day, they feed off of each other through the individual artist, so my experience with any of the arts, music or poetry or visual arts or architecture, influences me as an artist,” she said. 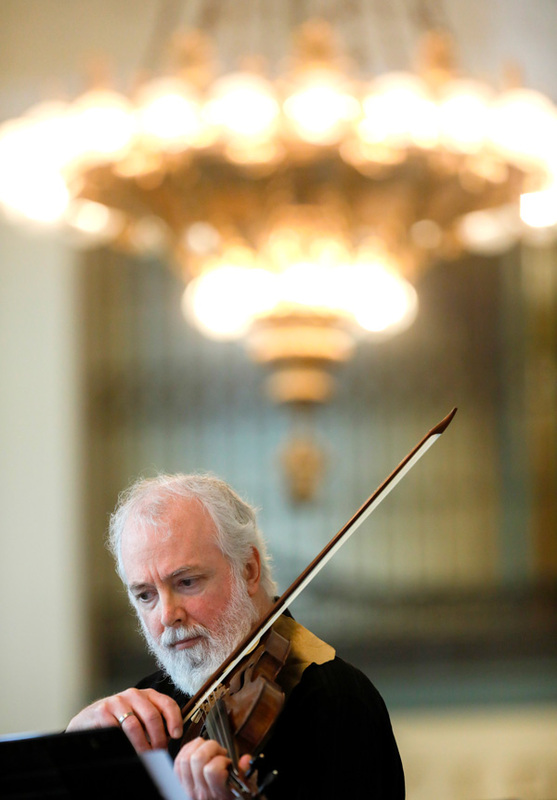 Ray-Carter came to Baroque performance practice mid-career, attracted by the sonorities of period music performed on period instruments, compared to modern instruments. “You can be much more subtle, you can create many more colors and textures and articulations on gut strings than you can on modern (steel) strings,” she said. She studied with Phoebe Carrai at the International Baroque Institute at Longy (IBIL), a week-long immersion program at Bard College, in 2007 and 2008. In 2009, she and some like-minded local musicians started KCBC under the auspices of the Jewell Early Music Summer Festival, where it remained until 2012. Since, they’ve worked with a number of choral groups, and now, as of February, are independently established as a 501(c)(3) non-profit organization. This first season includes three concerts, exploring this journey from Silence to Light through different mediums. The first concert, performed in June, featured John Lobell speaking about Kahn’s philosophy. The second is July 14 and incorporates the art work and writings of Makoto Fujimura, inspired by Shūsaku Endō’s book, “Silence.” The third, August 11, collaborates with the Owen/Cox Dance Group. The concerts are at St. Paul’s Episcopal Church, in the Gothic-style nave, a fitting venue for the ensemble and, with consideration to the limitations in volume and resonance in Baroque instruments, a wonderful acoustic environment, too. Along with Baroque repertoire, each concert also features a new composition by Ian Coleman, professor of music at William Jewell College. He was introduced to the project by his colleague Ron Witzke. Witzke, director of vocal studies and opera at William Jewell College, has been an influential contributor to the project’s development, introducing Ray-Carter to the historic fiction of Endō and its connection with the work of Fujimura. Coleman, though, was already inspired to write for this Baroque sound, after hearing Arvo Pärt’s “Da pacem, Domine,” a 20th-century composition, performed on Baroque instruments. While period instruments are less resonant, there is a “purity and a clarity to them that really seemed to work,” he said. The three pieces can be performed independently or together and are scored for two Baroque violins, Baroque cello and harpsichord. Writing for Baroque instruments, but not specifically in a Baroque style, was a challenge. “What I’m suddenly realizing is that I’m having to drop all these assumptions, in a sense, that I make about music,” Coleman said. “I’m trying to say something that is contemporary and of today, but I’m inevitably finding that the idiomatic ideas of Baroque style tend to be coming through, bubbling up from the surface a little bit when I’m working with it,” Coleman said. Coleman referenced the concept of music as “liquid architecture,” a phrase attributed to Johann Wolfgang von Goethe and quoted by many, including Frank Gehry. Fujimara also created a series of paintings entitled “Silence,” incandescent large scale works using rich pigments, gold dust, and abstract visions of smoke and shadow, which will be shown during the July concert. This process of exploration, of finding the common language among artists and art forms, of examining the manifold influences involved in creating art, and sharing that process, also allows the audience the opportunity to make an important and meaningful connection with the artist/performer. “It’s that journey within where we often find ourselves and a true sense of who we are,” said Ray-Carter. Kansas City Baroque Consortium presents “Between Silence and Light” at 7:30 p.m. July 14 and 7:30 p.m. August 11 at St. Paul’s Episcopal Church, 11 E. 40th St. For more information, call 816-550-3375 or visit www.kcbaroque.org.